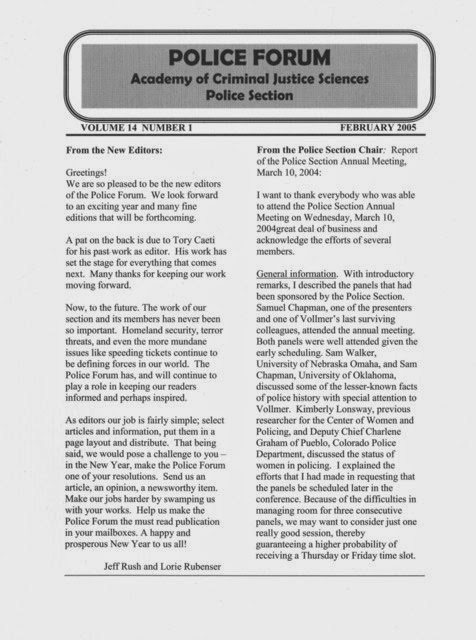 This is a copy of an article published in Police Forum 7(3):6-8, July 1997. Also available in pdf format. Please cite as: Deflem, Mathieu. 1997. “Policing International Society: Views from the United States.” Review essay on ‘Cops Across Borders,’ by Ethan A. Nadelmann and ‘Crime and Law Enforcement in the Global Village,’ edited by William F. McDonald. Police Forum 7(3):6-8. In recent years it has been commonplace, in popular as well as academic discourse, to discuss the increasing interconnectedness of social events across dispersed localities. The truism that the world is getting smaller has by now become a platitude. In the social sciences this has led to increasingly devote attention to structures and processes that cross the boundaries of confined spaces. Under the heading of globalization and international or cross-border studies, scholarly work has devoted much attention to political, economic, and cultural affairs that span the world. The disintegration of communism, the expansion of capitalism, and the reappearance of nationalist and ethnic strive have sharply indicated the relevance of this approach. Studies of law enforcement are mostly confined to well-defined geographical areas. Yet, in police research, too, growing concern is being directed at the flow of crime and its enforcement across delineated jurisdictions. In particular, two directions can be discerned in the broad area of international police studies. First, relying on a meanwhile fairly well-developed tradition, comparative research of policing uncovers the parallels and contrasts between police practices and ideologies in different parts of the world. Recent comparative police work has critically contributed to our understanding of the characteristics of national systems of law enforcement (e.g., Brodeur, 1995; Das, 1994; Marenin, 1995), police practices in municipalities of various countries (e.g., Chevigny, 1995), the use and abuse of selected police strategies across the world (e.g., Fijnaut & Marx, 1995), and the changing police experience in once autocratic, now democratizing, countries (e.g., Brogden & Shearing, 1993; Shelley, 1996). The implications of comparative police studies for criminal justice methodology and education in the United States have recently also been debated (e.g., Bayley, 1996; Ross, 1996). Second, additional attention is now also being focused, not on comparisons between police of distinct nations or regions, but on strategies and practices of law enforcement that traverse the borders of legal jurisdictions. Although there has been some earlier work in this area (e.g., Anderson, 1989), the two books under review here represent two groundbreaking contributions in this relatively new field of police research. Despite their international orientation, moreover, both works keep their perspective clearly on issues relevant to American policing. In Cops Across Borders, Ethan Nadelmann examines the international work of various U.S. law enforcement agencies from a perspective that merges a concern for international relations and foreign policy with an interest in criminal justice and police. Relying on documentary evidence and hundreds of interviews with police professionals and policy experts from nearly twenty countries, Nadelmann particularly researches the Americanization of policing in the area of drug enforcement, uncovering the critical intersections between political factors related to the U.S. national interest, on the one hand, and the limitations and powers of criminal law enforcement, on the other. The two central questions that guide Nadelmann’s analysis relate to, first, the motives and rationalizations of police of different states to cooperate, and, second, the conditions of the success or failure of this cooperation. On the basis of a detailed historical analysis of the international dimensions of U.S. law enforcement since the days of the formation of the Union, Nadelmann thematically devotes most attention to cross-border drug enforcement, additionally scrutinizing the enforcement of international treaties regarding the gathering of evidence and the extradition of fugitives. Also analyzed and richly documented are the variety and breadth of U.S.-controlled international police duties, ranging from the training of foreign police and the influencing of drug policies abroad to the planning and execution of unilateral police actions in foreign countries. Apart from the Drug Enforcement Administration (DEA), which quite clearly is the most prominent American agency with international duties, also reviewed is the international role of the Federal Bureau of Investigation, the U.S. Marshals Service, the Immigration and Naturalization Service, the Internal Revenue Service as well as the Central Intelligence Agency and military investigative units. Most critically, Nadelmann suggests a trend in American international police work from isolationism to a quest for, and rather successful fulfillment of, world dominance ("Americanization"). This expansion of international police duties Nadelmann does not solely contribute to an increase in cross-border criminal enterprise, but also to a gradual but steady expansion of federal laws with cross-border implications. American drug policy, most notably, involves a critical component of interdiction, tackling the flow of illicit substances from abroad. Yet, at the same time, Nadelmann demonstrates, there often is considerable variation in how American police agencies operate in foreign countries and cooperate with police abroad, depending on political concerns pertaining to foreign policy as much as on issues of international law and law enforcement. The diverging experiences of the DEA in Europe and Latin America, which deservedly receive detailed treatment by Nadelmann, are indicative in this respect. In the foreseeable future, Nadelmann predicts, the American role in world policing will anything but diminish. On the contrary, the internationalization of U.S. law enforcement will expand and diversify and it will be redefined in terms of national security interests. As in Nadelmann’s work, in the collection of writings edited by William McDonald in Crime and Law Enforcement in the Global Village, the role of American police agencies on the international scene takes center stage, although international police cooperation in Europe is not neglected (chapters by Malcolm Anderson and John Benyon). In addition, a multitude of law enforcement agencies, cross-border infractions, and problems of international policing are discussed. Most outstanding about the volume, and most pertinent to criminal justice scholars, is that it treats theoretically as well as empirically relevant issues, and that it includes ethical as wen as pragmatic considerations. The more theoretically oriented chapters (by William McDonald, Gary Marx, and Jonathan Winer) hint at a variety of issues police researchers will find valuable to consider when analyzing cross-border crime and law enforcement. The analytical value of studies in these areas is presented in terms of our understanding of the origins of domestic as well as foreign police systems, past and present dimensions, and formal and informal initiatives that point at change and continuity. But the difficulties in police cooperating across national borders, originating from and confronting divergent legal cultures, are also argued to affect the criminal justice community. In other words, more cooperation is needed also among police scholars, especially to tackle and scrutinize hard-pressing problems that emerge on the international arena with the expansion of a global economy and its repercussions for border control, organized crime, and police corruption. From a more empirical and practical viewpoint, the papers in this volume deal with some of the familiar issues, such as drug trafficking and money laundering (chapters by Nadelmann and Umberto Santino). But the authors broaden the debate by also touching upon otherwise less discussed themes. Particularly noteworthy are the examination of U.S.-Mexican border control in relation to developments in migration policy and the discussion on the enforcement of war crimes (chapters by McDonald and Gerhard Mueller, respectively). Moreover, the ethical and political concerns of international police work are usefully discussed by both a law enforcement practitioner and an ethics expert (contributions by Thomas Snow and Michael Davis). This opens the way for questions and answers regarding the proper balance between, on the one hand, pursuing the goals of criminal investigations and, on the other hand, normative and political considerations, especially with respect to human rights and foreign policy. This discussion, fortunately more provocative than definitive, offers a welcome addition to the more familiar contemplations surrounding the difficulties of differences in conceptions of crime and practices of law enforcement and punishment across the world. In recent years, scholarship on police in Europe has been extremely productive in the study of international developments, particularly devoting research to police cooperation alongside of the move towards European unification (e.g., Anderson & den Boer, 1994; Anderson et al., 1995; Fijnaut, 1993; van Duyne, 1993). The European lead in international police research is no doubt a factor of the geographical proximity of national jurisdictions in Europe and may as such be specific to the continent. However, investigations of international policing in Europe have also scrutinized the connections between European and American law enforcement, in both contemporary and historical contexts (Deflem, 1996; Verbruggen, 1995), and have begun to develop theoretical perspectives of international policing (Sheptycki, 1995; Vagg, 1993). As such, these studies of policing in the "new Europe" should also be of interest to police scholars in the United States. But the works under review here may signal an important new direction in American police studies and could serve as important stimuli for further investigations in the area, especially with a view from the United States. Ethan Nadelmann has done a particularly remarkable job in analyzing many of the critical empirical dimensions of international police work. His study is necessarily written from the singular perspective of one scholar (albeit it one with training in both law and political science). The collection of writings in Crime and Law Enforcement in the Global Village is a welcome supplement in that it brings together authors from various disciplines and backgrounds and unites theoretical and empirical work from the research community with insiders’ reflections of criminal justice practitioners. The potential for research on international police work in, and radiating from, the American continent is rich indeed. Recent scholarship has already begun to tackle some of these and related research challenges. Specifically noteworthy are studies on the militarization of law enforcement in connection with the war on drugs, border control, and migration policy (Dunn, 1996; Kraska & Kappeler, 1997), the specific characteristics of policing a multi-ethnic and highly urbanized society (Barlow, 1994; Herbert, 1997), the implications of cross-border crime control in terms of national sovereignty and jurisdiction (Asnis, 1996; Zagaris, 1996), and the challenges posed by the transnational expansion of organized crime markets (Myers, 1996; Sheptycki, 1996). The groundbreaking efforts by Nadelmann and McDonald and associates may serve as building-blocks to further expand on this work and develop a field of research grounded in theory and research and productive for police practice and policy. Anderson, M. (1989). Policing the world: Interpol and the politics of international police co-operation. Oxford: Clarendon Press. Anderson, M., & den Boer, M. (Eds.). (1994). Policing across national boundaries. New York: Printer Publishers. Anderson, M., den Boer, M., Cullen, P., Gilmore, W., Raab, C., & Walker, N. (1995). Policing the European Union. New York: Oxford University Press. Asnis, S.V. (1996). Controlling the Russian mafia: Russian legal confusion and U.S. jurisdictional power-play. Connecticut Journal of International Law, 11, 299-324. Barlow, D-E. (1994). Minorities policing minorities as a strategy of social control: A historical analysis of tribal police in the United States. Criminal Justice History, 15, 141-163. Bayley, D.H. (1996). Policing: The world stage. Journal of Criminal Justice Education, 7, 241-25 1. Brodeur, J.P. (Ed.) (1995). Comparisons in policing: An itlernational perspective. Aldershot, England. Avebury. Brogden, M., & Shearing, C.D. (1993). Policing for a new South Africa. New York: Routledge. Chevigny, P. (1995). Edge of the knife: Police violence in the Americas. New York: New Press. Das, D.K. (Ed.). (1994). Police practices: An international review. Metuchen, NJ: Scarecrow Press. Deflem, M. (1996). International policing in nineteenth-century Europe: The Police Union of German states, 1851-1966. International Criminal Justice Review, 6, 36-57. Dunn, T.J. (1996). The Militarization of the US-Mexico border, 1978-1992: Low- intensity conflict docirinecomeshome. Austin: University of Texas Press. Fijnaut, C. (1993). The Schengen treaties and European police cooperation. European Journal of Crime,Criminal Law and Criminal Justice, l(l), 37-56. Fijnaut, C., & Marx, G.T. (1995). Undercover: Police surveillance in comparative perspective.The Hague, The Netherlands: YJuwer. Herbert, S. (1997). Policing space: Territoriality and the Los Angeles Police Department. Minneapolis, MN: University of Minnesota Press. Kraska, P.B., & Kappeler, V.E. (1997). Militarizing American police: The rise and normalization of paramilitary units. Social Problems, 44, 1-18. Marenin, 0. (1995). Policing change, changing police: Imernational perspectives. New York: Garland Publishers. Myers, W.H. (1996). The emerging threat of transnational organized crime from the East. Crime, Law, and Social Change, 24, 181-222. Ross, J.I. (1996). The current status of comparative policing in the curriculum. Journal of Criminal Justice Education, 7,263-273. Shelley, L. (1996). Policing Soviet society: The evolution of state control. New York: Routledge. Sheptycki, J.W.E. (1995). Transnational policing and the makings of a postmodern state. British Journal of Criminology, 35, 613635. Sheptycki, J.W.E. (1996). Law enforcement, justice, and democracy in the trarisnational arena. International Journal of the Sociology ofLaw, 24, 61-75. Vagg, J. (1993). Context and linkage: Reflections on comparative research and "internationalism" in criminology. British Journal of Criminology, 33, 541-554.
vanDuyne,P. (1993). Implications of cross-border crime risks in an open Europe. Crime, Law, and Social Change, 20, 99-111. Verbruggen, F. (1995). Euro-cops? Just say maybe. European lessons from the 1993 reshuffle of U.S. drug enforcement. European Journal of Crime, Criminal Law, and Criminal Justice, 3(2),150-201. Zagaris, B. (1996). International security in the post-cold war era: Can international law truly affect global political and economic stability? Constructing a hemispheric initiative against transnational crime. Fordham International Law Journal, 19, 1888-1902. See related writings on international policing.